18K Rose gold case with a brown leather strap. Fixed bezel. Silver dial with rose gold-tone hands and index hour markers. Minute markers around the outer rim. Dial Type: Analog. Date display at the 3 o'clock position. Quartz movement. Scratch resistant sapphire crystal. Case diameter: 40 mm. Case thickness: 7.15 mm. Round case shape. Water resistant at 30 meters / 100 feet. Functions: date, hour, minute, second. Watch label: Swiss Made. Tissot Vintage Silver Dial Leather Strap Mens Watch T9204107603100. For more than 150 years, Tissot has embodied the innovation and tradition of Swiss watch-making. Based in the Neuchâtel area of the Jura Mountains, in Le Locle, Switzerland, Charles-Félicien Tissot and his son Charles-Emile created the watch making company Tissot in 1853. Whether in the technology of its movements, in the research for special materials or in the very functions of the watch itself, Tissot's engineers and watchmakers have developed pioneering timepieces over the years. 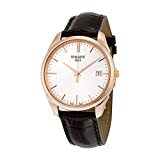 Some of Tissot's triumphs over the years include the the Idea 2001 (the world's first plastic watch) released in 1971, the Rock watch (which set the timepiece's movement in a stone case made from Swiss Alps granite) in 1985, and the Wood watch from 1988 (with a completely wooden case). Tissot uses the best movements (from ETA SA Manufacture Horlogère Suisse), the highest quality materials (316L steel, 18K gold, titanium) and scratch-proof glasses (sapphire crystal--at least 2500 Vickers). The company has been involved with high profile sports events since 1974 when they sponsored a racing car in the 24 Hours of Le Mans, France. Since then Tissot's timepieces have been chosen as official timekeepers for world championships in cycling, motorcycling, fencing and ice hockey. And Tissot is currently the the official watch and timekeeper of NASCAR.